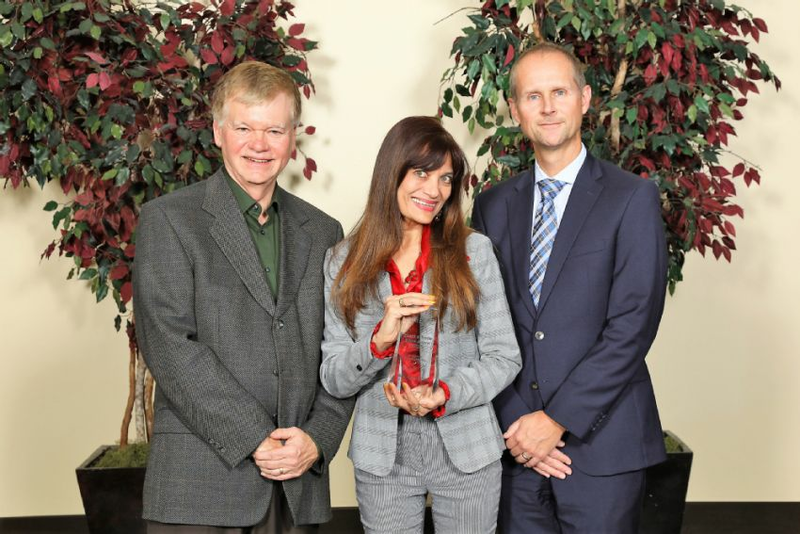 Rittal Systems’ REV Truck Drives Away with a Marketing Award from Electro-Federation Canada | Rittal - The System. 2018-11-07. Mississauga, ON. 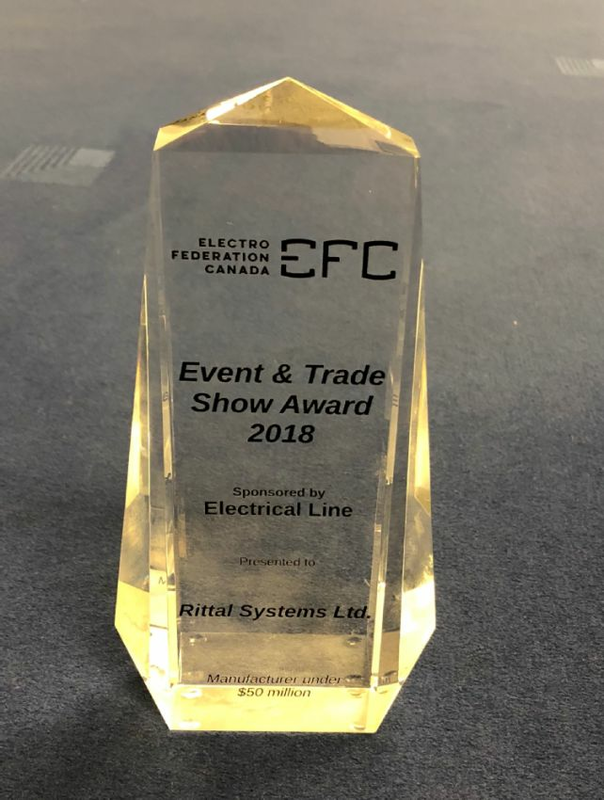 Rittal Systems Canada, the Canadian subsidiary of the world’s largest and most trusted manufacturer of enclosures, climate control systems, power distribution and software solutions was delighted to receive one of Electro-Federation Canada’s Marketing Awards. In the under $50 million category, for the second year in a row. Picture shows John Jefkins, VP, Member Engagement & Corporate Partnerships, Electro-Federation Canada presenting the award to Sandra Abuwalla, Marketing – Rittal Canada, and Tim Rourke, President, Rittal Systems Ltd.
An experienced and impartial panel of industry judges declared Rittal the winner of the Best Event & Trade Show Display Award, sponsored by Electrical Line , for the magnificent mobile Rittal Expo Vehicle (REV) which is the ideal mobile trade show vehicle to bring Rittal’s range of solutions to partners’ and customers’ doorsteps. The REV is a mobile showroom of Rittal innovations: enclosures, climate control, power distribution, software and systems, and IT infrastructure, so people everywhere can discover the fascinating world of Rittal at their doorsteps! The magnificent Rittal Expo Vehicle was a brain-child of Rittal Canada. Prior to the REV Truck, Rittal was challenged with showcasing its market-leading solutions at various locations across Canada, due to the difficulty in transporting this heavy equipment, and aesthetically displaying it at industry events. Rittal Canada researched, analysed the market, and over several months, developed the concept for the REV which would become a mobile showcase of the latest and greatest solutions that Rittal had to offer. Electro-Federation Canada‘s annual Marketing Awards program is designed to recognize Electro-Federation Canada (EFC) member organizations, representing electrical manufacturers, distributors and agents who demonstrate marketing excellence and innovation within the Canadian electrical industry. Electro-Federation Canada honoured the 2018 award recipients of its 5th annual marketing awards program at the EFC Future Forum event . This prestigious award program recognizes the best overall marketing campaigns that achieve program objectives by using comprehensive marketing strategies. Entries are evaluated based on whether the campaign meets its objectives and whether best practices have been demonstrated. This EFC award is a great testament of Rittal’s commitment to the industry through continuous product innovation and excellent customer service. Rittal Systems Ltd., headquartered in Mississauga, Ontario, is the Canadian Subsidiary of Rittal GmbH & Co. KG, with headquarters in Herborn, Germany, and is one of the world's leading system suppliers for enclosures, power distribution, climate control, IT infrastructure and software & services. Customers from all sectors of industry, from mechanical and plant engineering, as well as from the IT and telecoms market are making use of system solutions from Rittal. Founded in 1961, Rittal is now active worldwide with 10 production sites, 63 subsidiaries and 40 agencies. With 10,000 employees worldwide, Rittal is the largest company of the proprietor-run Friedhelm Loh Group of Haiger, Germany. www.rittal.ca .